Esther (Mathewson) Brooker was born July 16, 1930 in her grandparents’ home near Westford, NY. She grew up the third of six children on a dairy farm of about one hundred acres near Westford. In addition to dairy production, her father also grew crops, including buckwheat, oats, corn, and potatoes at different times. 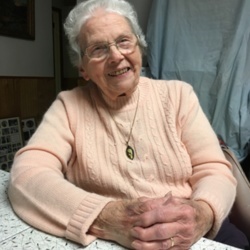 Her family was also very involved in the local community, her father serving on the school board and electric cooperative’s board, and her mother an active member of the church. Esther grew up in a time of much technological change and got to see tractors take the place of horses and electricity replace kerosene on her farm during her childhood. Influenced by the push for nurses in the 1940s, Esther obtained a bachelor’s in nursing at Hartwick College in Oneonta, NY, graduating in 1952. After graduating she held a variety of nursing positions in Cooperstown, Cobleskill, Oneonta, and Sidney in the next few years. She was always eager to gain different experiences in new healthcare settings and worked as an obstetric nurse, private duty nurse, and night supervisor at different times. Esther met her husband Louis Brooker at a local barn dance, and they married in 1956. They moved to a house in East Worcester where they raised their four children and where Esther still resides. The couple enjoyed 56 years of marriage before Louis’s passing in 2013. Esther continued working while raising her family, and in 1960 took a position as school nurse-teacher in Worcester Central School where she could be close to and hold the same hours as her children. Taking classes during her summers off, she received her Master’s in Education from SUNY Oneonta in 1966. She continued her position as school nurse-teacher for 18 years before returning to Bassett Hospital in 1979 as Discharge Planning Nurse. At this time Esther also got involved in a task force similar to hospice and used the breaks during her shifts at Bassett to spend time with patients associated with this group. After more than 35 years in the field, Esther retired in 1987 but continues to remain an active member of the Worcester community. I interviewed Esther in her home in East Worcester, NY, where she showed me pictures and a painting of the hop house still standing on her childhood farm near Westford. The farm is a cherished part of her life still today, and much of the interview centered on her experiences growing up on the farm, the camaraderie of the local community, and the methods and practices of farming as they changed through time. Esther’s lifelong passion for learning and understanding the world around her is demonstrated in her insights on farm life and detailed descriptions of farming processes, making this interview a valuable resource for those interested in agriculture and rural life as it evolved through the twentieth century. When transcribing the interview, I edited for clarity but worked to retain the message of Esther’s words; however, I encourage researchers to listen to the audio recordings, as the demonstrative power of Esther’s inflection and storytelling cannot be captured on page. Despite the many interesting topics covered in this interview, it covers a mere fraction of Esther’s experiences. Her long and varied nursing career spent spread across the local area would provide wonderful insight into rural healthcare, and a second interview covering these topics is suggested. This is the November 19, 2018 interview of Esther Brooker by Kirbie Sondreal for the Cooperstown Graduate Program’s Research and Fieldwork course recorded at Esther’s home in East Worcester. All right, Esther, to get started I thought we might start with a little bit about your childhood and where you grew up. What was it like growing up on the farm? It was fun. Looking back, it was a very good time. We didn’t have a lot of money, but we never went without eating because we grew a garden. My father had a dairy farm, so I didn’t know we were poor. Actually, we were not. We were very rich. My father had met my mom when he was cutting ice at her father’s farm on Skellie Road in Westford. Back then, the farmers harvested ice in the winter, cut it into rectangular blocks, and stored it in an icehouse, which we had, with sawdust between the cakes of ice. That would cool the milk from the cows in the summer. Daddy would put the milk cans in a vat in the milk house. He would transfer the milk from the barn to the milk house, and then a truck would come and pick it up and carry it to the milk station. We played outside back then. We played games like hide and seek. We loved to go out and collect fireflies, put them in a jar, and of course, let them go. That was fun collecting them. We played leapfrog, all sorts of things. And of course we had chores around the farm. Some of us spent more time in the barn helping Daddy, and others were assigned to the house. Of course, with a range of twenty years in children, it was different. As the years went by the older children grew up, married, and moved away. Then later I went off to college, and then the young ones grew up and eventually moved away. Our clothing was simple. We had clothes for school, and then we’d get home and change our clothes, put on different clothes to play or work in. Everybody had woodstoves back then, so probably all of our clothes smelled like wood smoke in school. [laughter] We road a bus to school. I first attended Westford School, and later on the schools in the area were centralized and a new school was built in Schenevus. It was called the Andrew S. Draper Central School. Andrew S. Draper had been born in Westford, and I believe he was eventually the head of the Education Department in Albany. The school is now called Schenevus Central School. When I started, there were two classes in a room in school—first and second grade, and third and fourth grade, and fifth and sixth grades were on the first floor. Others were upstairs. Maybe even the fifth and sixth were upstairs. That was a long time ago. I liked school, and it was kind of easy for me. With two classes in the same room, when I would finish my work, the teacher would let me help the other children with their work, who school didn’t come so easy for. I liked that. I liked helping the other kids learn. I liked to learn. I liked to teach one-on-one, not a classroom full, but one-on-one I loved to teach and share my knowledge. We raised most of our vegetables. We did have apple trees in the orchard and a cherry tree. My mom taught me how to can the fruits and the vegetables. Usually we would raise pigs, and Daddy would have a hog butchered maybe once every year. Occasionally, we had beef, but more often it was a pig that we butchered. Daddy didn’t butcher it himself. He had someone do it, and then we would cut it up and even can some of the meat. If it was canned properly, it kept very well. I got to help my mom in the garden. I enjoyed that, and that followed me through my life. One of the highlights of the year would be a family reunion because all the relatives would gather, and we would have all sorts of dishes. People would bring different dishes of food, and we got to enjoy others’ cooking. That was always a big treat. The big thing in the summer, we could make ice cream in an old-fashioned crank ice cream maker with ice. We didn’t have electricity then, so when electricity came, things changed eventually quite a bit. At first my dad, older sisters, and mom were having to milk by hand. Then later on Daddy got a gasoline-driven engine to have milkers for the cows. We also had [kerosene]-powered refrigerator in our house. It was a monster! [laughter] At the bottom there was a heater and it heated as it ran and somehow made refrigeration to make things cool. I cannot explain how that worked. I don’t remember having an icebox at our house, but I visited my grandmother next door a lot, and she used to have an icebox. I was kind of intrigued by that. Of course the source of the ice would not be an iceman bringing the ice but Daddy’s icehouse. They would just go take a cake of ice out, brush the sawdust off, and use it. What do you know about the ice-harvesting process? I never actually saw it myself, but I’ve seen pictures of the men with their long saws. They had to wait until the ice was a certain depth—I can’t tell you what that was—but then they would take the saws and cut the blocks of ice and then skid them off the pond. Then somebody with a truck would deliver them to the farms. I understand that farmers got together and helped each other do that. Apparently once in awhile they hired someone to do it, because when my Daddy moved from the Triple Cities—that would be the Endicott area—he worked at my grandfather’s pond helping cut the ice. I don’t know if they took it by sleigh anywhere or if it was just all trucked out. They probably used sleighs early on. They had to pack it carefully when they put it in the icehouse so that it would be stable and be well insulated with the sawdust and be able to stand in the icehouse until they were ready the next summer to use it actually. I have no idea how much those weighed but they were pretty heavy because they were pretty large…maybe a yard, 36 inches by maybe…[gestures roughly two feet across] We had ice tongs to handle them with. They had sharp points and you’d grab the cakes with the ice tongs. Probably everybody knows what an ice tong looks like. They’d be sharp and they’d just grab them into the ice and then lift the ice with those. Another thing we did on the farm was the haying, and that’s much different than today. Sometimes early on, farmers would put loose hay on a horse-drawn wagon, after they had cut it and raked it up in rows. Then later we had a loader that we put behind the wagon that pulled the hay up onto the wagon. Then we’d drive the horses to the barn, pull them into the barn floor, and we’d use a hay[fork]. It was kind of built like the ice tong that we’d put into the loose hay and then with a pulley system pull it into the haymow. And I think many, if not most, haymows had maybe a front part and a back part with a beam sort of in the middle. I know when the hay got high enough, we kids always liked to jump off the beam into the hay. The only problem was when the haymow got really full, you would have to climb a ladder to get into the haymow. Getting off the ladder was not so bad, but I did not like getting back onto that ladder to come down. That was scary, but I did like playing in the haymow. We all liked that, and we would jump far, too. Some jumps would make our neck kind of [motions stiff neck] jolt. [laughter] We got to be daredevils. Winters were a bit different back then. Sometimes the roads would be so full of snow, the farmers would have to go across a field with a horse and sleigh to get where they needed to go, like to take the milk to the creamery. They used to have itinerant milk testers who would come to the house. The milk had to be checked every once in awhile for the amount of butterfat that was in it, and so sometimes he would have to get to our house cross lots with snowshoes on. I remember that. Then he would do his testing. I don’t remember if he came every month or how often he came, but on some sort of regular basis he did that. Because the more butterfat you had in the milk, I think, the more money you got. I’ve seen pictures with snow banks sometimes up to second-story windows. That was not really unusual back then. A few years ago we had snowstorms that reminded me of the old days. As far as shopping, we had a Sears catalog, but we more often would order from the Montgomery-Ward catalog. That was easy, but sometimes the things that were ordered didn’t fit. I remember it happened to me one time. We ordered this pair of shoes that I liked so much. When they got there, they were too small and I couldn’t wear them. We had to send them back. Sometimes, people from cities liked to come to farms for vacations, and my dad had a buddy that he had worked with at IBM when he lived in the Endicott area. His buddy Carl, his wife Opal, and their son Claude would come and sometimes stay a week or two at the farm. They’d live there, and we’d feed them and have a good time. I remember Opal made me my first brand new dress. I can still see the dress in my mind’s eye. That was a big thrill. We got a lot of hand me downs, and I got luckier than my older sisters. I don’t know which cousins or where their clothes came from, but we had a city cousin that lived in Endicott. I would get her hand me downs, and they were a little fancier than some of my sisters’. That was nice. My mother was not a big sewer like some people were. I had an aunt that sewed a lot, made a lot of her children’s clothes. I’m sure my mother made some, but not to the degree that Aunt Silva did. My mother did teach me how to embroider and to operate a sewing machine. She didn’t teach me to knit, but we did crotchet a little. Knitting I learned later on by myself. Our water supply came from a spring up the hill in the cow pasture. Up there, there was a little springhouse that covered the well to keep it clean, keep it fresh. That was good water. Of course, it came to the house by gravity, because we didn’t have electricity until 1944 at the farm. They had it in town, but it wasn’t until the Tennessee Valley Project happened and a rural electrification act was put into force. With that [Otsego Electric Cooperative] came to the more rural areas, to the farmers, and my dad was very active in that. He was visiting other farmers to get them interested in signing up to have electricity, and that way they got enough farmers to make it worthwhile for them to bring the electricity to the farmers. He served on the board of the Otsego Electric [Cooperative]. A lot of people in Otsego County still get their electricity from the Otsego [Electric Cooperative]. He served on the board until he was nearly 90, if not 90. He also was a tax collector. He was also a member of the fire department. Was it a volunteer fire department? Yes, and presently Westford has a very excellent fire department that has carried through the years. I found out later in life that he was also on the school board of the Westford School. My mother was active in church. She played the organ at one time and played for the choir to practice. I believe sometimes they did that at our home. And the church suppers. We had them then as well as now, and they were always looked forward to. Mom would always be baking pies for that, and the teenagers used to wait on tables. Our family did as well as others in the area. I believe the kids are still doing that today, and Westford, they still have excellent church dinners. At one time there were many churches, some before my time. There was a Baptist church that was not functioning in my growing up time, so we attended the Methodist church. There was a Congregational church also that eventually became a community hall. There was an Episcopal church, and the Catholic people went to the Catholic Church in Schenevus. Now the Methodist and the Episcopal are the only active churches there. How did getting electricity change life on the farm? …well, and made sure we kids learned to also. What kind of chores did you have to do growing up? Oh, I had to dust, help with the cleaning in the house, and do dishes, and when I got old enough, they let me drive the tractor to hoist the hay up into the hayloft, too. I did some other activities on the farm, maybe helping feed the cows. I never did milk a whole cow by myself. Fortunately, we got the [milking machines] before I had to do that, but my sisters did. They milked cows right along with my mom and dad. Telephones back then, my grandmother had one on the wall I remember, because one day when she was talking, we had a thunderstorm and the lightning came there. It didn’t hurt her, but I was little and I crawled under the kitchen table, I remember. [laughter] Then later we had telephones that you could dial. We were on a party line. There were eight or twelve people on a party line. That was interesting. So the lightning struck the telephone while your aunt was on it you said? It was my grandmother. I spent a lot of time with my paternal grandparents. They had a farm next door. Could you tell me a little bit more about the people from the city who came out to vacation on the farms? Well, I don’t know what kind of a job Carl had. I think he was still working at IBM, and Opal was a housewife. Claude was a little younger than my oldest brother, so they played together. I don’t know a lot more about them really, except my dad and Carl had worked together, so that’s how Daddy knew them. They enjoyed coming. They didn’t actually do any work around the farm, except Opal did make me a dress. She probably did some other sewing, but the dress is what I remember. My mom had another older friend from the city who liked to come in September when the corn and the tomatoes were ripe. She’d come and help my mom can some vegetables. Was that something you were involved with as well? Yes, I helped plant and harvest from the garden and pull weeds. I liked to pull weeds. I didn’t mind pulling weeds. We had a lot of quackgrass in our garden, so we spent a lot of time getting that out. One of the big entertainments years ago was square dancing. That was big. My husband’s parents used to go to dances and take their kids along. He remembered that, but our family didn’t ever do that. It was just a different area, maybe, but the reason I mention that, I met my husband at a barn dance at Tyler’s. Harold Tyler was a local farmer who had a large maple business. He was well known in the area. He had barn dances once in awhile, and when I was grown—it was after I was in college, I was actually working—I went to a dance there, and my husband was there. So we always liked to square dance. Where was your husband from? Outside of East Worcester is a little area called Brooker Hollow, and back then a lot of Brookers lived on Brooker Hollow. Now there are none, but he was born in Brooker Hollow, so that would be the town of Richmondville actually, I think. He went to school in a little one-room schoolhouse in Brooker Hollow, and then he went to high school at Worcester Central School. My schooling was, through fifth grade, at Westford, and then my sixth-grade year was in Schenevus after they centralized. I went there and graduated there with about 30 kids that graduated with me. I went to Hartwick College. I decided I wanted to be a nurse, probably in part because I had an uncle who was a nurse. He was in administration at Binghamton State Hospital, and he saw a lot of nursing students who came for their affiliations there. He liked the ones from a hospital in Johnson City. Because of that, I went there and had an interview and was accepted, but after that a Hartwick recruiter came to our school and administered some tests that we could take to try to get a scholarship. So when I was awarded my scholarship, I changed streams and went to Hartwick College instead. Edith Lacey was the director of what was the school of nursing at that time, in 1948. It was very excellent; I got a really good education there. Prices were a little different then. I never personally bought any gasoline for eleven cents a gallon, but I’ve heard people say they have. I didn’t drive until I was twenty, so I wasn’t buying gasoline, but it was quite different. I do remember thirty cents in my driving time. We had two stores in Westford. We had Tyler’s General Store and then I believe at one time, the post office was there, but in my time in Westford, it was at Johnny Palmer’s store. Johnny also had a little truck and would peddle hot dogs house to house. They were always so good! [laughter] There used to be a man that would come around to the farms and pick up rags. I don’t know what he did with them, what they used them for. These days, I know they recycle some rags, but I have no idea whether he sold them to people who worked in garages to clean their hands, I don’t know. Our heat for cooking and for heating the house was wood. Daddy would cut the trees down and chop them up and bring them. I remember when I was little, maybe three-ish, my oldest sister Thelma and I had measles at the same time. We were in the living room, and my mom would open the door of the stove, and there’d be nice coals in there. She would have a toaster—a hand toaster, wire toaster—that she’d put a slice of bread in, and it was hinged so the bread didn’t fall out. She’d put it over those coals and make the best toast. Then we had a big cooking stove in the kitchen. That didn’t have a thermostat on it. It didn’t have a thermometer in it, so you would kind of bake by guess and by gosh. You’d adjust your fire in the stove to try to make your oven the right temperature, so it wasn’t quite as exact as it is today with the electric stoves. But it worked! We had good things come out of that oven. We ate a lot of potatoes. My dad always grew potatoes. Then later on when I was older, sometimes he would buy them from another farmer in town who grew a lot of potatoes just for selling. Actually, at one time Daddy did grow potatoes for selling, but one year, the price dropped out of the bottom. I don’t know what caused that, but after that he didn’t raise potatoes except for our own home use in the garden. What other crops did he grow? He grew buckwheat, oats, I think some barley, and corn. The corn went into the silo, and I always looked forward to harvesting time. The farmers helped each other harvest—thresh the wheat and harvest the corn. The farmers would all come and do the job, and then the host—the farmer that was getting helped—his wife and kids prepared a meal and fed them. That was fun to have neighbors come in and have a nice meal together. That was always fun. I’m trying to remember whether all the corn was cut by hand when I was little. It was put on a wagon, and then someone would have a corn blower that would chop up the corn and blow it up into the silo. Someone had to be in the silo and kind of level it out as it came down into the silo. They have different kinds of equipment for that now, as well as the threshing of the other crops. So did your family grow hops? No, there were some hops still growing in one field on the farm, but the hops had kind of gone. I was born in 1930 and I don’t remember anyone in town having hops actually processing the hops. They would put them in this special barn and dry them. I don’t know the whole process, but I know the town of Westford has a lot of pictures before my time of people who were picking the hops. Our hop house is one of the few left in Otsego County. It’s on County Road 36A in Westford, so it is a landmark sort of. Oh, you saw in the picture. That’s kind of history. I have no knowledge of how all of that worked. At one time Otsego County was a very big producer of hops, and I understand it’s starting toward that way again. People are growing hops these days. Churches back then were pretty much the center of social activities. I mentioned the dinners that they had. They had a young peoples’ group, sometimes it was called Epworth League. The ladies also had an organization called WCTU, and that was the Women’s Christian Temperance Union. Westford also had a group for kids called the LTL, which stood for Loyal Temperance Legion. I attended that, and I know we had picnics because one day downtown kids coaxed me to go swimming with them. There was a millpond in Westford. That was a swimming hole for the town kids, but our family didn’t get to go there. Swimming was unusual for me, and not knowing how to swim, I nearly drowned. Donald Huntington saved me. He pulled me out. So thanks, Don. [laughter] That was one of the things kids in town did for recreation. We sort of just ran around on the farm, playing tag, and hide and seek, stuff like that. It was fun, and much healthier than what kids do today with all the electronic gadgets. So we are nearing the end of our time. How do you think that the landscape in this area has changed through your lifetime? I don’t know about the landscape itself, but the use of the land has changed a lot. There used to be lots and lots of farms; that was the thing for the area. There are very few farms in the area anymore, and that’s sad. We still have pretty awesome autumn colors that’s one big plus of this area. It’s beautiful in the fall, just beautiful. The towns have changed a lot, because there used to be a lot of stores. A big thing that happened to Westford, there were a lot of stores and a lot of churches, but when they put the D&H [Delaware and Hudson Railways] train through, it went through Schenevus. At that point Westford started losing ground commercially. I’m trying to think. The farm life was a good life. It was healthy air; it was good. Is your farm still in your family? … there, because I wanted to wash the diapers. [laughter] I was four years old; I didn’t know any better. But I guess maybe that was the beginning of my interest in nursing. I had a lot of experience along the way. When Olive was born I was 14, and I just took over her care. I was her second little mother. All right, well, thank you so much for doing this interview with me. You’re very welcome. I wish I could’ve done a better job. You did wonderfully. Were there any last things you wanted to add? 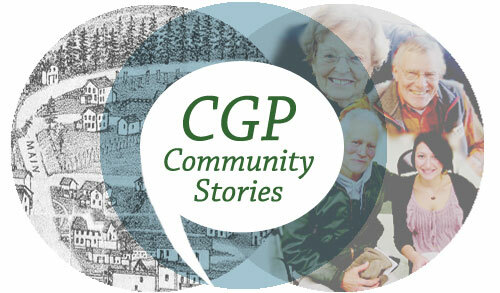 Kirbie Sondreal, “Esther Brooker, November 19, 2018,” CGP Community Stories, accessed April 25, 2019, http://cgpcommunitystories.org/items/show/360.